Obama Talks Of Slavery, Romney Of Freedom At Clinton Global Initiative : It's All Politics President Obama and Mitt Romney took very different approaches in their speeches at the Clinton Global Initiative meeting in New York. Obama focused on the scourge of human trafficking, while Romney proposed tying U.S. foreign aid to job creation and economic reforms in recipient nations. President Obama talked of the world's need to crack down on human trafficking at the Clinton Global Initiative annual meeting in New York on Tuesday. One presidential candidate talked about slavery, the other of freedom. And the speeches President Obama and Mitt Romney gave at the Clinton Global Initiative in New York on Tuesday were as different as the men themselves. Obama's topic was the tragedy of human trafficking and efforts by his administration to address a problem affecting the developing and developed worlds alike, including the U.S.
Romney, for his part, spoke of free markets and their power to increase economic well-being in developing countries. 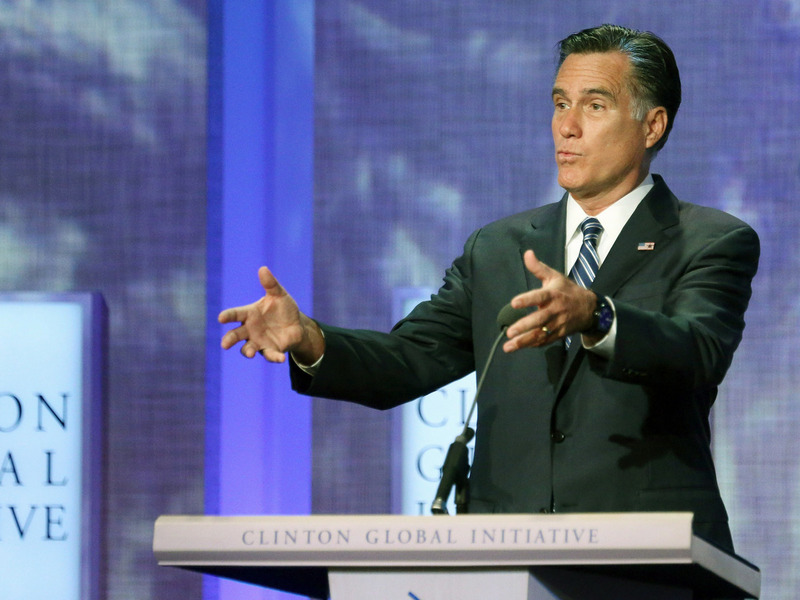 Republican presidential nominee Mitt Romney proposes linking foreign aid to economic reforms abroad at the Clinton Global Initiative meeting on Tuesday. Obama's speech was the least overtly political of the two, which isn't to say it wasn't written or delivered without any political motivation. Virtually everything an incumbent president does this close to an election is run through a political filter. "... It ought to concern every nation because it endangers public health and fuels violence and organized crime. I'm talking about the injustice, the outrage of human trafficking, which must be called by its true name, modern slavery. "Now, I — I do not use that word, 'slavery,' lightly. It evokes, obviously, one of the most painful chapters in our nation's history. But around the world, there's no denying the awful reality. When a man desperate for work finds himself in a factory or on a fishing boat or in a field, working, toiling for little or no pay and beaten if he tries to escape, that is slavery. When a woman is locked in a sweatshop or trapped in a home as a domestic servant, alone and abused and incapable of leaving, that's slavery. When a little boy is kidnapped, turned into a child soldier, forced to kill or be killed, that's slavery. When a little girl is sold by her impoverished family — girls my daughters' age — runs away from home, or is lured by the false promise of a better life and then imprisoned in a brothel and tortured if she resists, that's slavery. It is barbaric and it is evil, and it has no place in a civilized world." 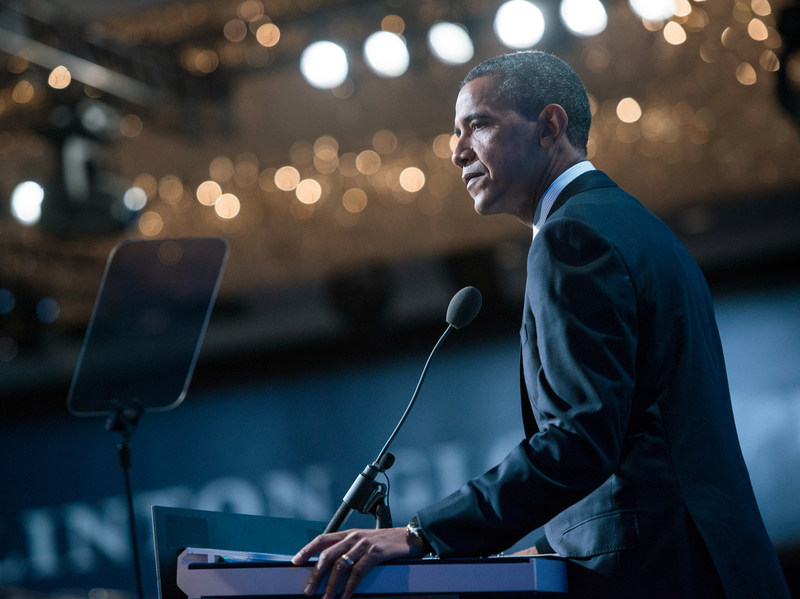 The speech gave Obama the chance to highlight his administration's efforts to fight human trafficking. He used the incumbent's advantage to talk about his record and to announce new initiatives. For instance, the president announced Tuesday that his administration had started an effort to educate law enforcement and educators, among others, about the telltale signs of human trafficking. He promised that his administration would rely more on technology to stop traffickers. They were the kinds of steps unlikely to require significant spending. While Obama avoided borrowing language from his campaign speeches, Romney didn't. "I will never apologize for America. I believe that America has been one of the greatest forces for good the world has ever known. We can hold that knowledge in our hearts with humility and unwavering conviction." Romney has accused Obama of apologizing for the U.S. and thereby showing weakness. He has even alleged in the past that Obama started his term with an "apology tour," a charge journalistic fact-checker PolitiFact.com called totally false. The former Massachusetts governor's big idea was for the U.S. to take an approach in foreign policy reminiscent of workfare — that such aid be tied to efforts in recipient nations to increase work opportunities for their people. The assistance should also be linked to reform efforts in developing nations to strengthen the legal and other institutions necessary to reduce corruption, Romney said. And in a proposal that seemed aimed as much at U.S. voters as audiences overseas, Romney called for foreign aid to be tied to recipient nations opening their markets to U.S. companies. "A temporary aid package can jolt an economy. It can fund some projects. It can pay some bills. It can employ some people some of the time. But it can't sustain an economy — not for long. It can't pull the whole cart — because at some point, the money runs out. "... As the most prosperous nation in history, it is our duty to keep the engine of prosperity running — to open markets across the globe and to spread prosperity to all corners of the earth. We should do it because it's the right moral course to help others. "But it is also economically the smart thing to do. In our export industries, the typical job pays above what comparable workers make in other industries, and more than one-third of manufacturing jobs are tied to exports. Sadly, we have lost over half a million manufacturing jobs over the last three and a half years. "As president, I will reverse this trend by ensuring we have trade that works for America. I will negotiate new trade agreements, ask Congress to reinstate Trade Promotion Authority, complete negotiations to expand the Trans-Pacific Partnership, and create what I call a 'Reagan Economic Zone,' where any nation willing to play by the rules can participate in a new community committed to fair and free trade. Because it was former President Clinton who introduced both men Tuesday, it was perhaps inevitable that both of this year's major party presidential candidates would note the former president's star turn at the Democratic National Convention. ROMNEY: "If there's one thing we've — we've learned this election season, by the way, it is that a few words from Bill Clinton can do any man a lot of good. "All I got to do now is wait a couple of days for that bounce to happen, so ..."
"Well, good afternoon, everybody. And President Clinton, thank you for your very kind introduction, although I have to admit I really did like the speech a few weeks ago a little bit better. "Afterwards somebody tweeted that somebody needs to make him secretary of explaining things. Although they didn't use the word 'things.'"